The humble doorbell is set for a connected upgrade thanks to two projects, one that launched today on Indiegogo and the other that hopes to ship a working product next month. 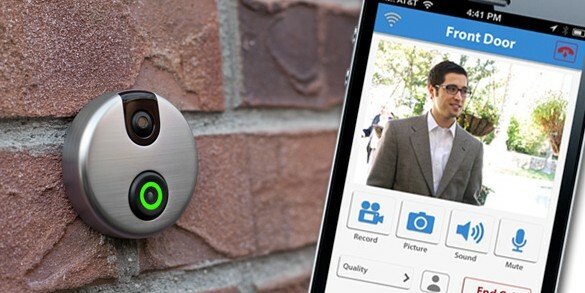 Both products add a camera and connectivity to doorbells and let you see who’s at the door from your smartphone. This is handy if you’re like me and can’t hear your doorbell from all parts of the house, or if you’re like my husband who is worried about people ringing the doorbell, finding no one home and then robbing you. This might not stop the robbers, but you’ll at least know what they look like. 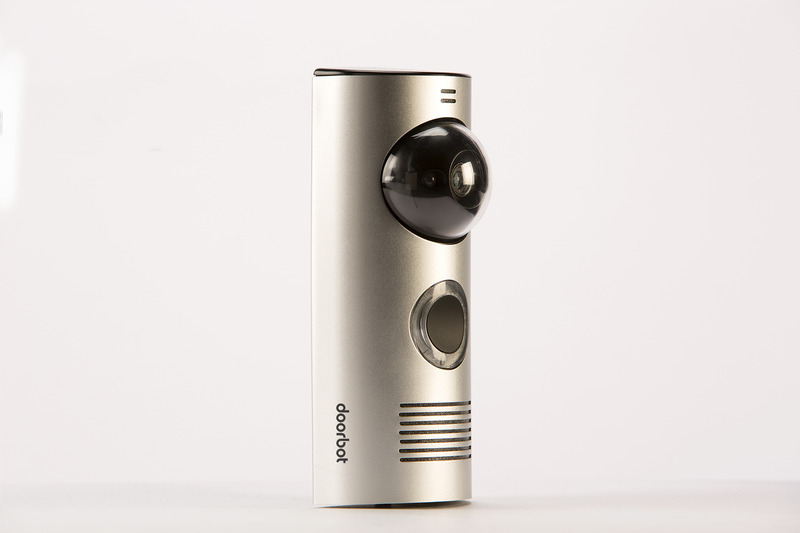 The product launching today on Indiegogo is the iDoorCam, which you can get for $127 if you buy it on the site and about $160 if you buy it later. It should ship in October. It screws into a faceplate and uses your doorbell’s existing wires to hook into a power supply. When someone rings the doorbell, it notifies you and you can talk to them from your phone. They can talk to you via the doorbell. And if someone knocks you can activate the doorbell camera from the app running on your handset and see who’s there. For now this is iOS only, with plans for Android support coming in January 2014 (earlier if the campaign raises a lot more money). The second product, the DoorBot, was crowdfunded last year on Christie Street, and ships next month. It’s larger, but doesn’t have to be plugged in to your doorbell wiring to work. The DoorBot costs $200 on pre-order but offers many of the same features. The primary differences are cosmetic and the battery-powered nature of the DoorBot. I think both of these products are pretty compelling, and while Jamie Siminoff, the inventor of the DoorBot, thinks connected doorbells are complementary with connected door locks, I’m not so sure I’d shell out for both. Especially if you’re planning on installing a Goji smart lock that also has a camera. A $200 doorbell and a $200 lock is a tough sell outside of the early adopter set. Still, Siminoff says a partnership with Lockitron, which makes connected door locks, has led to a lot of people pre-ordering the DoorBot, so clearly some people are viewing the two as a pair (and have money to burn). What’s more interesting to me is Siminoff’s belief that in the next three to four years people will spend between $1,500 to $2,000 on connected devices in their homes. Maybe that will be spent on Nest thermostats, Hue lightbulbs, connected locks and doorbells, but the bottom line is that’s a lot of money to be spent on gear that might come from a bunch of new companies. I’m still trying to quantify the internet of things, and I think his estimates are a bit high. Though if I track my spending on connected widgets in the last few months, I’ve already shelled out at least $700 in addition to the Sonos I already have. Thank you for meeting my customer’s needs, I hope – Monday will tell. I was given a request for an entry video – audio which she could use at a fixed location in her kitchen, using an IPAD which she had inerited. I told her that I would rather set it up so that she could use the IPAD in her garage or at a couple of outside locations if I could do it inexpensively enough. It looks like I might be able to meet that need. i’ve been tracking these types of products both smart locks and smart doorbells for some time. there’s a huge market for home automation, which i believe in greatly. i’m in the middle of setting up my garage door that can open with my smart phone. anyway, as soon as i learned about idoorcam i ordered mine immediately. Thank you for your input Evan. I still have some customers with X10 which was great 15 years ago. I spent hours when a customer wanted another X10 dimming in line module (not the switch) and finally went to Insteon which is what I now use anyway. One of my current projects is to HomeLinc a visor garage door button to an X10 fixture module which I installed. SmartHome.com did not have the entry audio – video I wanted in looking for these types of device and I was having some issues with casual google searches. I want to build a link reference library for this type of equipment. Stacey, it’d be really useful if you note whether these sorts of Internet of Things devices support IPv6 or not.